Joshua A.C. Newman is the publisher of Mobile Frame Zero. 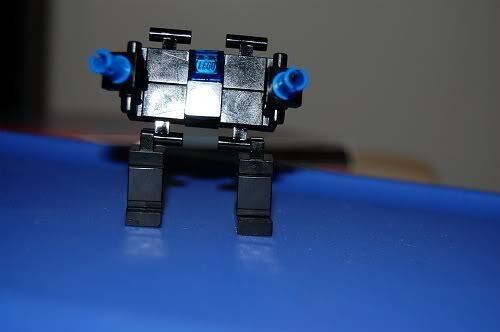 Lately he's been trying to write, manage the kickstarter, answer questions about MFZ, and work on the game. He has had a few moments to do interviews though. The first was with Darrin Bowers, aka Zeekhotep, over on the No BS, Just ABS blog. The second is an audio interview with Benjamin Wenham over at Geeksourcing. The last is with CL Varner over at The Critical Table. Sheesh, you'd think the guy had a clone or something. 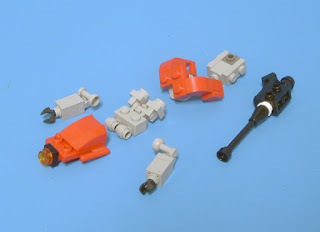 Another new blog has popped up for MFZ. Tyrona: Shattered Planet is dedicated to detailing an new setting for Mobile Frame Zero. Give it a look. Here's multiple views of the Commisar I built. I think that last shot should answer everyone's questions. 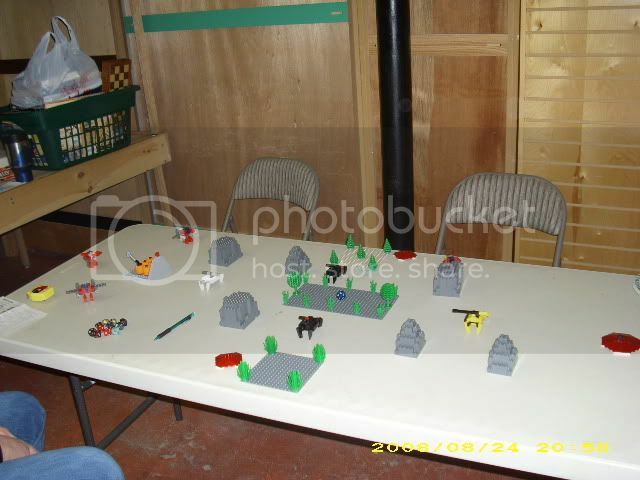 There are more pictures here in the brickshelf gallery I made for it. Here's multiple views of the Conscript I built. As always, mine are a little different due to parts supply and general building whims. The basic concept is the same though. I have another new blog to report, Bots of Westeros. This one looks like it could be very interesting. 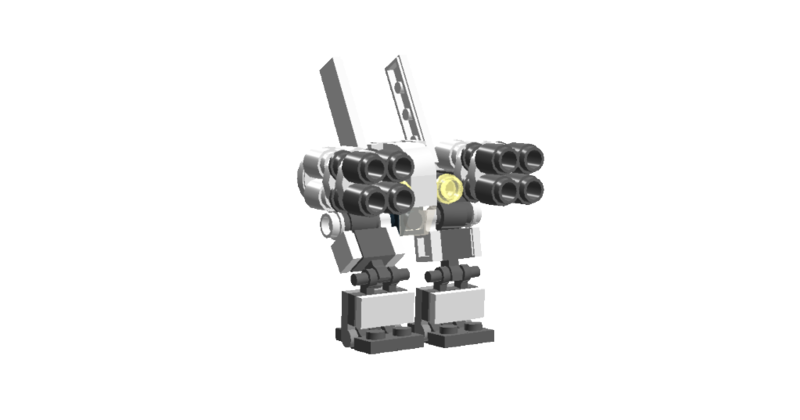 The MFZ community also has a wiki. Rock on people, rock on. The first thing people generally do for Mobile Frame Zero is build mechs, even before reading the rules :-). If you're not used to building with Lego putting the small parts together in an attractive and functional manner can be frustrating. I'll try and help by looking at breakdowns of the official frames, naming some parts, and walking through the assembly process. The Hi-Leg comes in two flavors, the first I call the Soldier. It's based on the Regult from Macross. 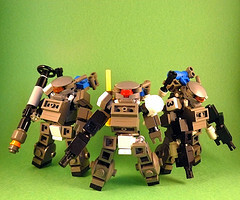 (Supposedly the OST--- series of mechs from Battle tech is based on the Regult. They have arms though!) It has chicken legs; a tiny, bulbous body; and weapons sticking out at odd angles. Here's the Breakdown Soren sent me. I think that's pretty straightforward. The second is what I like to call the Leader. Based heavily on the Glaug from Macross -- most people know it as the Marauder from Battletech -- it features chicken legs, T.Rex arms, and a heavy gun. The hard part here is seeing the Tile, Modified 1x1 w/Clip sticking down from the Plate, Modified 1x2 w/Handle on Side (Free Ends). The tile connects to the "torso". You can see it in the picture of the Soldier above, surrounded by the legs and the upper body. 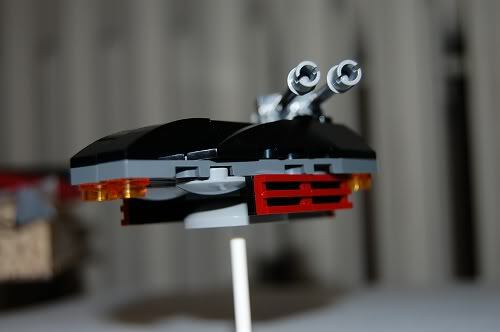 I will say that I found the connection for the "Gun Pod" to be awkward and it puts a lot of stress on the two studs that hold the pod to the main body. Here's a look at the Soldier I assembled. 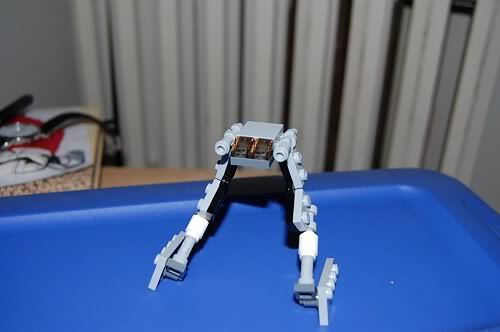 If you look closely you'll see I did away with the Dish 2x2 Inverted in the torso and connected the Clip Tile directly to the Travis Brick that connects the legs. Here's a look at the leader I assembled. I changed the mount for the gun to a Jumper Plate and a Plate, Modified 1x2 w/Clip Horizontal on End instead of the brick mount that Soren uses. There are a few variations of both Hi-Leg designs out there, but it hasn't taken off yet like the Chub. 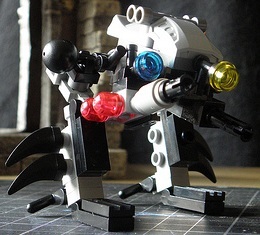 WTF-04C HiLeg 'Lancer" by jed_september. Featuring some slight parts swapping but a great use of color. 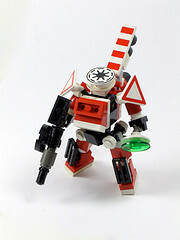 WTF-04G HiLeg 'Loyalist' by jed_september. This has to be one of my favorite mods of the Hi-Leg. The "Duckbill" cockpit design is just brilliant. I know it's a little early in the lifetime of my blog to be doing a spotlight piece but, I feel this man does not get enough credit. He posts as ParadoxBoy over on the RPG.net Forums -- Seriously, why are the rest of you not there? You saw how many discussions threads from there I linked to in my first post. 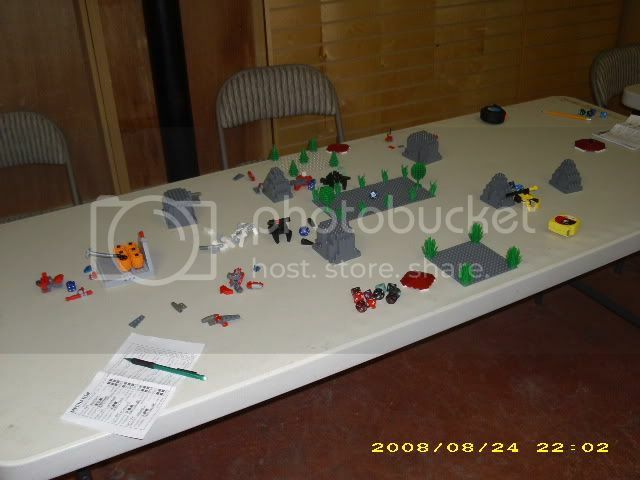 -- and deathischeap on Photobucket. He's always has a kind word to say about your creations and fresh ideas if you ask for them. He's also prolific, dear lord is he prolific. I have it straight from him that he has LDD open for most of the day on his desktop. He's even made a status sheet for MFZ. In fact, the only bad thing I can say about him is that he's not on Flickr. Dude! Whay are you not on Flickr? It's where the action is! Edited to add: He now has a Flickr account. Enough chatting him up, let's look at his work. I have a copy of this in my files. 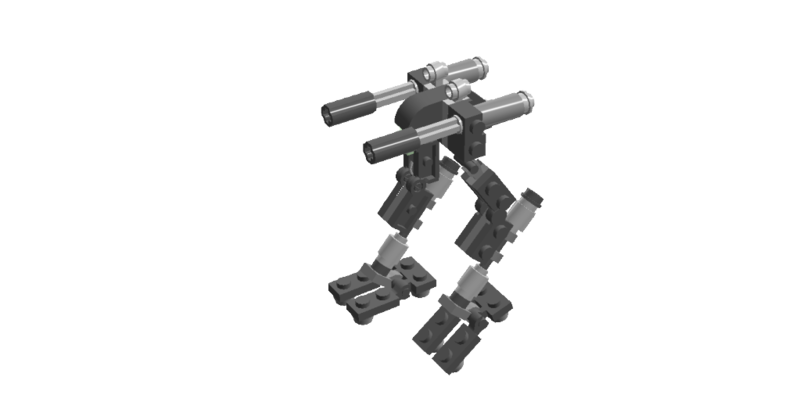 This is his second LDD design, the Sylph Mk.2. The Dao, seen above, is when he starts hitting his stride. And his latest creation, the Kappa. Go. Now. Look at his creations. There's a large number of them I did not include in this Spotlight article. Here's the breakdown of the Commisar that Soren Sent me. The hard part for me to decipher was the back pack. 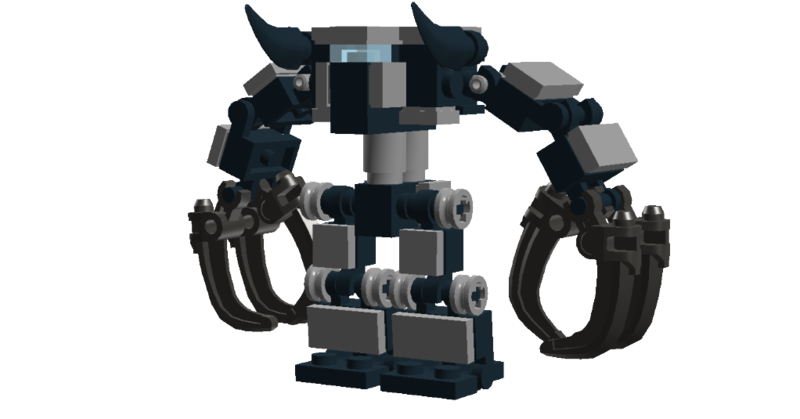 The torso of the mech is two 1x1 Plate, Modified w/Clip Light (Thick Ring). Two more of these are attached to the top one with the clips facing backwards. This shifts the orientation into the vertical axis and the backpack builds both up and down from this point. 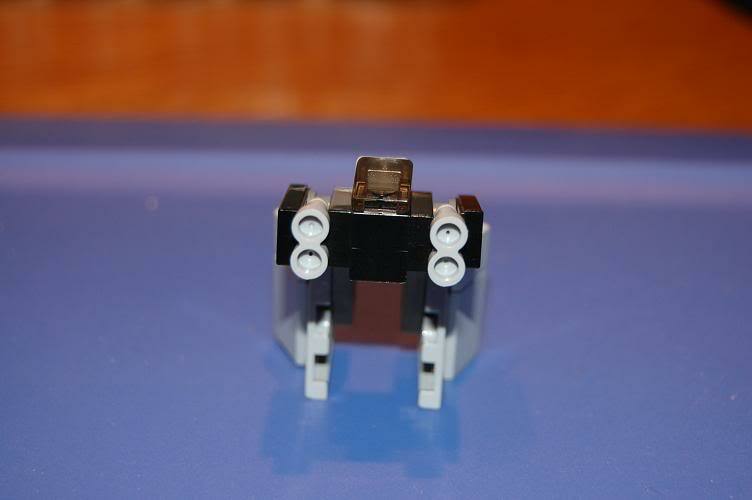 It looks like the central brick of the backpack is a 1x2 Technic Brick w/Holes mounted on top of a "Jumper" Plate. The Jumper Plate is mounted on the clips. I'm in the middle of building my own Commisar and I already have a Conscript assembled. Unfortunately I don't have any single pictures of either. Hopefully I can remedy that in the next couple of days. So far there hasn't been a lot of modding done with this frame. MLF-002 Prometheus by FoxhoundSe7en. This shows a Commisar with additional weapons. However, there is one person that's been doing a great deal of work with this frame. He is DrWatsman / Dr.Watsman. Top Left: Rag Tag Team by Dr.Watsman. Bottom Left: Cute Team by DrWatsman. Bottom Right: Wasps by DrWatsman. These three pictures show ﻿a portion of what he's done with the Conscript frame. Spend some time perusing his Flickr stream, you won't regret it. 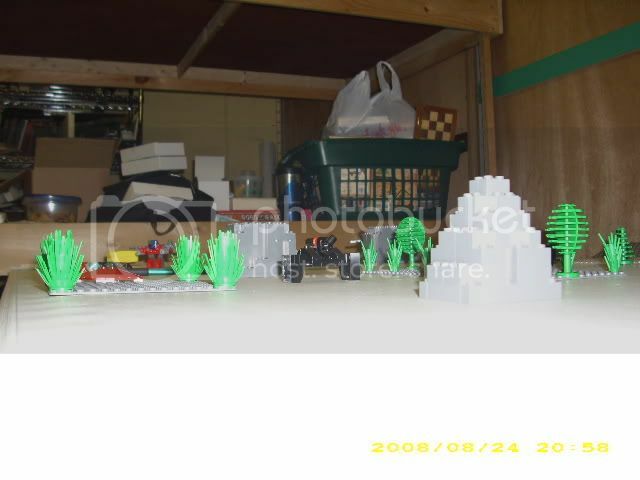 I was uploading some pictures to Photobucket today and "stumbled" across some pictures of an old Mechaton game. 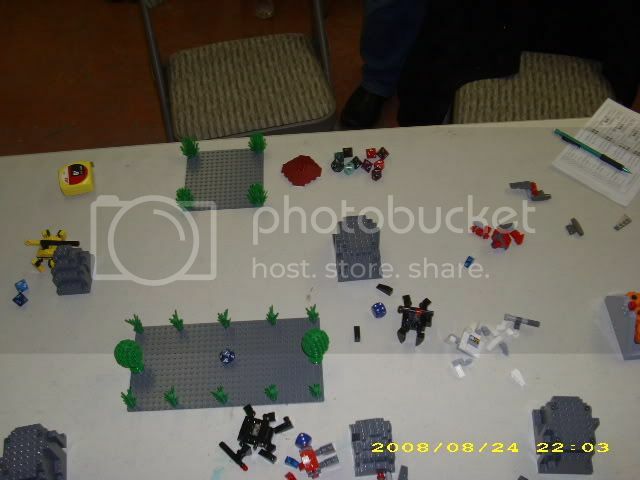 These pictures were taken back in 2009 at a BosTan Gameday in Pandemonium Book & Games' gameroom. Hopefully the limited amount of pictures gives you some sense of what was happening in the game. Ever since MFZ was mentioned on the Penny Arcade blog it has been growing in leaps and bounds. The Flickr group has doubled in membership, and there seem to be blogs and websites popping up all over the place. Seriously. 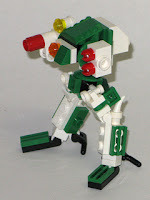 Just plug "Mobile Frame Zero" into Google and see what happens. Anyway, here are a few sites for you so you don't have to do the whole Google thing. Orion6 -- A new blog from Flickr member MittenNinja. 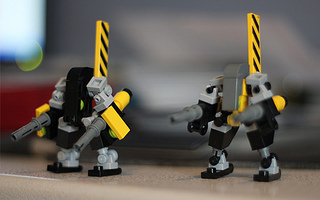 Mobile Frame Hangar -- A new website from Flickr member SchoonPine. Mobile Frame Hangar Forums -- The corresponding forums for the above website. Here's the breakdown of the Chub that Soren sent me. The thing that confused me the most was how the arms attached to the body. The Bar 1L w/Clip Mechanical Claw which attaches to the Tap 1x1 inside the torso is a little hard to see in the photos of the assembled mech. It drove me nuts for the longest time. Before I received the assembly instructions I even came up with an alternate attachment device using Minifig Utensil Handlebars. Here's a look at the base model that I assembled. Can everyone see how that ﻿goes together? Here's a few variations on the theme. UMFL 4th (Syrene) Brigade, Recon Commandos by Jed September. As always this shows good use of color, main and accents, and additional parts to change the look from the base model. If you take a close look at the head, you can see it's attached a little differently than the standard model. 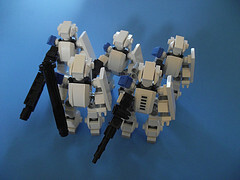 Blue Squad by Viro-M. An excellent variation on the head along with a unified color scheme. 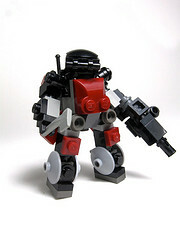 Red Unit "Kingfisher" by Ironsniper. 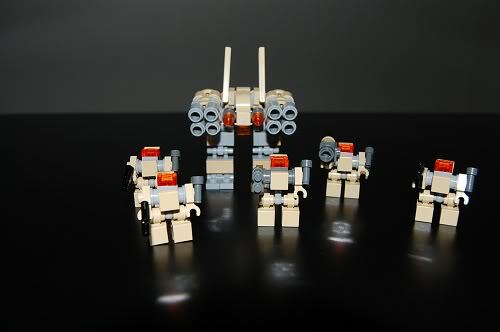 And here we can see where Viro-M got the inspiration for the heads on his mechs. Salvage Chub by Ross Varn. 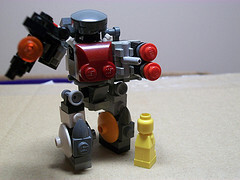 This shows good use of putting together a mech with the parts that you have on hand. ST07W-WACKY by SchoonPine. This shows how adding parts to a basic Chub frame can change the look of the frame. 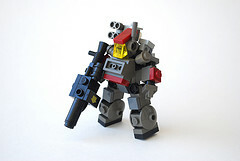 Commander Foss' Custom ST-10 by Joshua A.C. Newman. 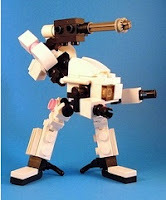 Here we see one of the first Chub mods by one of the creators of Mobile Frame Zero. It uses additional parts and a unified color scheme to set it apart from the base model. 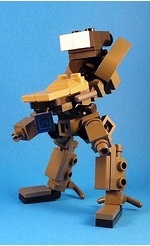 Legionnaire Koenig's ST-07 by Joshua A.C. Newman. Another Chub mod by J. Not that heavily modified, just a variant chest piece and an altered head. An extra weapon and a unified color scheme help to make it different. Hopefully this gives everyone a good look at how the Chub frame is assembled and some ideas on how to modify it to make your frames more unique.